Diffuse reflection spectra of lunar regolith samples extracted at depths of 118 and 184 cm by the 1976 soviet probe Luna 24 showing minima near 3, 5 and 6µm, valence-vibration bands for water molecules. The image shows the distribution of surface ice at the Moon's south pole (left) and north pole (right), detected by NASA's Moon Mineralogy Mapper instrument. Lunar water is water that is present on the Moon. Liquid water cannot persist at the Moon's surface, and water vapor is decomposed by sunlight, with hydrogen quickly lost to outer space. However, scientists have conjectured since the 1960s that water ice could survive in cold, permanently shadowed craters at the Moon's poles. Water molecules are also detected in the thin layer of gases above the lunar surface. Water (H2O), and the chemically related hydroxyl group (-OH), can also exist in forms chemically bound as hydrates and hydroxides to lunar minerals (rather than free water), and evidence strongly suggests that this is indeed the case in low concentrations over much of the Moon's surface. In fact, adsorbed water is calculated to exist at trace concentrations of 10 to 1000 parts per million. Inconclusive evidence of free water ice at the lunar poles had accumulated during the second half of the 20th century from a variety of observations suggesting the presence of bound hydrogen. On 18 August 1976 the Soviet Luna 24 probe landed at Mare Crisium, took samples from the depths of 118, 143 and 184 cm of the lunar regolith and then took them to Earth. In February 1978 it was published that laboratory analysis of these samples shown they contained 0.1% water by mass. Spectral measurements shown minima near 3, 5 and 6 µm, distinctive valence-vibration bands for water molecules, with intensities two or three times larger than the noise level. On 18 November 2008, the Moon Impact Probe was released from ISRO's Chandrayaan-1 an Indian Spacecraft at a height of 100 kilometres (62 mi). 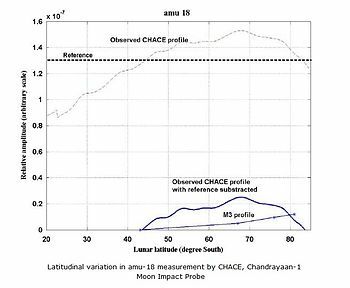 During its 25-minute descent, the impact probe's Chandra's Altitudinal Composition Explorer (CHACE) recorded evidence of water in 650 mass spectra gathered in the thin atmosphere above the Moon's surface. In September 2009, NASA payload Moon Mineralogy Mapper onboard Chandrayaan-1 detected water on the Moon surface and hydroxyl absorption lines in reflected sunlight. In November 2009, NASA re-confirmed water on moon with its LCROSS space probe which detected a significant amount of hydroxyl group in the material thrown up from a south polar crater by an impactor; this may be attributed to water-bearing materials – what appears to be "near pure crystalline water-ice". In March 2010, it was reported that the Mini-SAR on board Chandrayaan-1 had discovered more than 40 permanently darkened craters near the Moon's north pole that are hypothesized to contain an estimated 600 million metric tonnes (1.3 trillion pounds) of water-ice. Further analysis by Chandrayaan-1 published in 2018 revealed evidence of water ice patches near the surface of both poles, acting as cold traps for any water on the moon. In August 2018, NASA confirmed water ice on the surface of the moon for the first time, at the moon poles. Water may have been delivered to the Moon over geological timescales by the regular bombardment of water-bearing comets, asteroids and meteoroids  or continuously produced in situ by the hydrogen ions (protons) of the solar wind impacting oxygen-bearing minerals. The search for the presence of lunar water has attracted considerable attention and motivated several recent lunar missions, largely because of water's usefulness in rendering long-term lunar habitation feasible. Beginning with a full-frame Moon in this video, the camera flies to the lunar south pole and shows areas of permanent shadow. Realistic shadows evolve through several months. On 24 September 2009 it was reported that the Moon Mineralogy Mapper (M3) spectrometer on India's Chandrayaan-1 spacecraft had detected water ice on the Moon. M3 detected absorption features near 2.8–3.0 μm (0.00011–0.00012 in) on the surface of the Moon. For silicate bodies, such features are typically attributed to hydroxyl- and/or water-bearing materials. On the Moon, the feature is seen as a widely distributed absorption that appears strongest at cooler high latitudes and at several fresh feldspathic craters. The general lack of correlation of this feature in sunlit M3 data with neutron spectrometer H abundance data suggests that the formation and retention of OH and H2O is an ongoing surficial process. OH/H2O production processes may feed polar cold traps and make the lunar regolith a candidate source of volatiles for human exploration. M3 is an imaging spectrometer that was one of the eleven science instruments on board Chandrayaan-1 lunar orbiter, whose mission came to a premature end on 29 August 2009. M3 was aimed at providing the first mineral map of the entire lunar surface. Lunar scientists had discussed the possibility of water repositories for decades. They are now increasingly "confident that the decades-long debate is over" a report says. "The Moon, in fact, has water in all sorts of places; not just locked up in minerals, but scattered throughout the broken-up surface, and, potentially, in blocks or sheets of ice at depth." The results from the Chandrayaan-1 mission are also "offering a wide array of watery signals." The possibility of ice in the floors of polar lunar craters was first suggested in 1961 by Caltech researchers Kenneth Watson, Bruce C. Murray, and Harrison Brown. Although trace amounts of water were found in lunar rock samples collected by Apollo astronauts, this was assumed to be a result of contamination, and the majority of the lunar surface was generally assumed to be completely dry. However, a 2008 study of lunar rock samples revealed evidence of water molecules trapped in volcanic glass beads. The first direct evidence of water vapor near the Moon was obtained by the Apollo 14 ALSEP Suprathermal Ion Detector Experiment, SIDE, on March 7, 1971. A series of bursts of water vapor ions were observed by the instrument mass spectrometer at the lunar surface near the Apollo 14 landing site. In February 1978 Soviet scientists M. Akhmanova, B. Dement'ev, and M. Markov of the Vernadsky Institute of Geochemistry and Analytical Chemistry published a paper claiming a detection of water fairly definitively. Their study showed that the samples returned to Earth by the 1976 Soviet probe Luna 24 contained about 0.1% water by mass, as seen in infrared absorption spectroscopy (at about 3 μm (0.00012 in) wavelength), at a detection level about 10 times above the threshold. Composite image of the Moon's south polar region, captured by NASA's Clementine probe over two lunar days. Permanently shadowed areas could harbour water ice. A proposed evidence of water ice on the Moon came in 1994 from the United States military Clementine probe. In an investigation known as the 'bistatic radar experiment', Clementine used its transmitter to beam radio waves into the dark regions of the south pole of the Moon. Echoes of these waves were detected by the large dish antennas of the Deep Space Network on Earth. The magnitude and polarisation of these echoes was consistent with an icy rather than rocky surface, but the results were inconclusive, and their significance has been questioned. Earth-based radar measurements were used to identify the areas that are in permanent shadow and hence have the potential to harbour lunar ice: Estimates of the total extent of shadowed areas poleward of 87.5 degrees latitude are 1,030 and 2,550 square kilometres (400 and 980 sq mi) for the north and south poles, respectively. Subsequent computer simulations encompassing additional terrain suggested that an area up to 14,000 square kilometres (5,400 sq mi) might be in permanent shadow. The Lunar Prospector probe, launched in 1998, employed a neutron spectrometer to measure the amount of hydrogen in the lunar regolith near the polar regions. It was able to determine hydrogen abundance and location to within 50 parts per million and detected enhanced hydrogen concentrations at the lunar north and south poles. These were interpreted as indicating significant amounts of water ice trapped in permanently shadowed craters, but could also be due to the presence of the hydroxyl radical (•OH) chemically bound to minerals. Based on data from Clementine and Lunar Prospector, NASA scientists have estimated that, if surface water ice is present, the total quantity could be of the order of 1–3 cubic kilometres (0.24–0.72 cu mi). In July 1999, at the end of its mission, the Lunar Prospector probe was deliberately crashed into Shoemaker crater, near the Moon's south pole, in the hope that detectable quantities of water would be liberated. However, spectroscopic observations from ground-based telescopes did not reveal the spectral signature of water. More suspicions about the existence of water on the Moon were generated by inconclusive data produced by Cassini–Huygens mission, which passed the Moon in 1999. In 2005, observations of the Moon by the Deep Impact spacecraft produced inconclusive spectroscopic data suggestive of water on the Moon. In 2006, observations with the Arecibo planetary radar showed that some of the near-polar Clementine radar returns, previously claimed to be indicative of ice, might instead be associated with rocks ejected from young craters. If true, this would indicate that the neutron results from Lunar Prospector were primarily from hydrogen in forms other than ice, such as trapped hydrogen molecules or organics. Nevertheless, the interpretation of the Arecibo data do not exclude the possibility of water ice in permanently shadowed craters. In June 2009, NASA's Deep Impact spacecraft, now redesignated EPOXI, made further confirmatory bound hydrogen measurements during another lunar flyby. As part of its lunar mapping programme, Japan's Kaguya probe, launched in September 2007 for a 19-month mission, carried out gamma ray spectrometry observations from orbit that can measure the abundances of various elements on the Moon's surface. Japan's Kaguya probe's high resolution imaging sensors failed to detect any signs of water ice in permanently shaded craters around the south pole of the Moon, and it ended its mission by crashing into the lunar surface in order to study the ejecta plume content. The People's Republic of China's Chang'e 1 orbiter, launched in October 2007, took the first detailed photographs of some polar areas where ice water is likely to be found. Image of the Moon taken by the Moon Mineralogy Mapper. Blue shows the spectral signature of hydroxide, green shows the brightness of the surface as measured by reflected infrared radiation from the Sun and red shows a mineral called pyroxene. On Friday 9 October 2009, as the spent upper stage of NASA's Lunar Reconnaissance Orbiter launcher smashed into the Cabeus lunar crater, the LCROSS probe attempted to detect water in the ejecta plume before it also crashed itself onto the lunar surface. On November 14, 2008, the Indian spacecraft Chandrayaan-1 released the Moon Impact Probe (MIP) that impacted Shackleton Crater, of the lunar south pole, at 20:31 on 14 November 2008 releasing subsurface debris that was analyzed for presence of water ice. On 25 September 2009, ISRO announced that the MIP had discovered water on the moon just before impact. This research was published on September 24, 2009. MIP discovered water on the Moon before NASA's M3 but the announcement of this discovery was not made until NASA confirmed it. On September 25, 2009, NASA declared that data sent from its M3 confirmed the existence of hydrogen over large areas of the Moon's surface, albeit in low concentrations and in the form of hydroxyl group ( · OH) chemically bound to soil. This supports earlier evidence from spectrometers aboard the Deep Impact and Cassini probes. On March 2010, it was reported that the Mini-SAR on board Chandrayaan-1 had discovered more than 40 permanently darkened craters near the Moon's north pole that are hypothesized to contain an estimated 600 million metric tonnes of water-ice. The radar's high CPR is not uniquely diagnostic of either roughness or ice; the science team must take into account the environment of the occurrences of high CPR signal to interpret its cause. The ice must be relatively pure and at least a couple of meters thick to give this signature. The estimated amount of water ice potentially present is comparable to the quantity estimated from the previous mission of Lunar Prospector's neutron data. 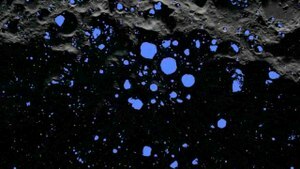 Although the results are consistent with recent findings of other NASA instruments onboard Chandrayaan-1, M3 discovered water molecules in the Moon's polar regions, while water vapor was detected by NASA's Lunar Crater Observation and Sensing Satellite, or LCROSS) this observation is not consistent with the presence of thick deposits of nearly pure water ice within a few meters of the lunar surface, but it does not rule out the presence of small (<∼10 cm (3.9 in)), discrete pieces of ice mixed in with the regolith. Additional analysis with M3 published in 2018 had provided more direct evidence of water ice near the surface within 20° latitude of both poles. In addition to observing reflected light from the surface, scientists used M3's near-infrared absorption capabilities in the permanently shadowed areas of the polar regions to find absorption spectra consistent with ice. At the north pole region, the water ice is scattered in patches, while it is more concentrated in a single body around the south pole. Because these polar regions do not experience the high temperatures (greater than 373 Kelvin), it was postulated that the poles act as cold traps where vaporized water is collected on the moon. The search for lunar ice continued with NASA's Lunar Reconnaissance Orbiter (LRO) / LCROSS mission, launched June 18, 2009. LRO's onboard instruments carried out a variety of observations that may provide further evidence of water. On October 9, 2009, the Centaur upper stage of its Atlas V carrier rocket was directed to impact Cabeus crater at 11:31 UTC, followed shortly by the LCROSS spacecraft that flew into the ejecta plume and attempted to detect the presence of water vapor in the debris cloud. Although no immediate spectacular plume was seen, time was needed to analyze the spectrometry data. On November 13, 2009 NASA reported that after analysis of the data obtained from the ejecta plume, the spectral signature of water had been confirmed. However, what was actually detected was the chemical group hydroxyl ( · OH), which is suspected to be from water, but could also be hydrates, which are inorganic salts containing chemically-bound water molecules. The nature, concentration and distribution of this material requires further analysis; chief mission scientist Anthony Colaprete has stated that the ejecta appears to include a range of fine-grained particulates of near pure crystalline water-ice. A later definitive analysis found the concentration of water to be "5.6 ± 2.9% by mass". The Mini-RF instrument on LRO observed the LCROSS landing site and did not detect any evidence of large slabs of water ice, so the water is most likely present as small pieces of ice mixed in with the lunar regolith. LRO's laser altimeter's examination of the Shackleton crater at the lunar south pole suggests up to 22% of the surface of that crater is covered in ice. In May 2011, Erik Hauri et al. reported 615-1410 ppm water in melt inclusions in lunar sample 74220, the famous high-titanium "orange glass soil" of volcanic origin collected during the Apollo 17 mission in 1972. The inclusions were formed during explosive eruptions on the Moon approximately 3.7 billion years ago. This concentration is comparable with that of magma in Earth's upper mantle. While of considerable selenological interest, this announcement affords little comfort to would-be lunar colonists. The sample originated many kilometers below the surface, and the inclusions are so difficult to access that it took 39 years to detect them with a state-of-the-art ion microprobe instrument. The formation of one water molecule requires the presence of two adjacent hydroxyl groups, or a cascade of successive reactions of one oxygen atom with two protons. This could constitute a limiting factor and decreases the probability of water production, if the proton density per surface unit is too low. Solar radiation would normally strip any free water or water ice from the lunar surface, splitting it into its constituent elements, hydrogen and oxygen, which then escape to space. However, because of the only very slight axial tilt of the Moon's spin axis to the ecliptic plane (1.5 °), some deep craters near the poles never receive any sunlight, and are permanently shadowed (see, for example, Shackleton crater, and Whipple crater). The temperature in these regions never rises above about 100 K (about −170 ° Celsius), and any water that eventually ended up in these craters could remain frozen and stable for extremely long periods of time — perhaps billions of years, depending on the stability of the orientation of the Moon's axis. Although free water cannot persist in illuminated regions of the Moon, any such water produced there by the action of the solar wind on lunar minerals might, through a process of evaporation and condensation, migrate to permanently cold polar areas and accumulate there as ice, perhaps in addition to any ice brought by comet impacts. The hypothetical mechanism of water transport / trapping (if any) remains unknown: indeed lunar surfaces directly exposed to the solar wind where water production occurs are too hot to allow trapping by water condensation (and solar radiation also continuously decomposes water), while no (or much less) water production is expected in the cold areas not directly exposed to the Sun. Given the expected short lifetime of water molecules in illuminated regions, a short transport distance would in principle increase the probability of trapping. In other words, water molecules produced close to a cold, dark polar crater should have the highest probability of surviving and being trapped. To what extent, and at what spatial scale, direct proton exchange (protolysis) and proton surface diffusion directly occurring at the naked surface of oxyhydroxide minerals exposed to space vacuum (see surface diffusion and self-ionization of water) could also play a role in the mechanism of the water transfer towards the coldest point is presently unknown and remains a conjecture. The presence of large quantities of water on the Moon would be an important factor in rendering lunar habitation cost-effective since transporting water (or hydrogen and oxygen) from Earth would be prohibitively expensive. If future investigations find the quantities to be particularly large, water ice could be mined to provide liquid water for drinking and plant propagation, and the water could also be split into hydrogen and oxygen by solar panel-equipped electric power stations or a nuclear generator, providing breathable oxygen as well as the components of rocket fuel. The hydrogen component of the water ice could also be used to draw out the oxides in the lunar soil and harvest even more oxygen. Analysis of lunar ice would also provide scientific information about the impact history of the Moon and the abundance of comets and asteroids in the early Inner Solar System. The hypothetical discovery of usable quantities of water on the Moon may raise legal questions about who owns the water and who has the right to exploit it. The United Nations Outer Space Treaty does not prevent the exploitation of lunar resources, but does prevent the appropriation of the Moon by individual nations and is generally interpreted as barring countries from claiming ownership of in-situ resources. However most legal experts agree that the ultimate test of the question will arise through precedents of national or private activity. Some private companies such as Shackleton Energy Company are already asserting their right to own whatever resources they remove and/or benefit from the Moon or asteroids through their own effort, risk and investment. The Moon Treaty specifically stipulates that exploitation of lunar resources is to be governed by an "international regime", but this treaty has not been ratified by any of the major space-faring nations. ^ "Atmosphere of the Moon". space.com. Retrieved 2015-05-25. ^ "Is There an Atmosphere on the Moon? | NASA". nasa.gov. Retrieved 2015-05-25. ^ a b Lucey, Paul G. (23 October 2009). "A Lunar Waterworld". Science. 326 (5952): 531–532. Bibcode:2009Sci...326..531L. doi:10.1126/science.1181471. PMID 19779147. ^ Clark, Roger N. (23 October 2009). "Detection of Adsorbed Water and Hydroxyl on the Moon". Science. 326 (5952): 562–564. Bibcode:2009Sci...326..562C. doi:10.1126/science.1178105. PMID 19779152. ^ a b Akhmanova, M; Dement'ev, B; Markov, M (February 1978). "Water in the regolith of Mare Crisium (Luna-24)?". Geokhimiya (in Russian) (285). ^ a b Akhmanova, M; Dement'ev, B; Markov, M (1978). "Possible Water in Luna 24 Regolith from the Sea of Crises". Geochemistry International. 15 (166). ^ a b c Crotts, Arlin (October 2011). "Water on The Moon, I. Historical Overview". Astronomical Review. 6 (8): 4–20. arXiv:1205.5597. Bibcode:2011AstRv...6h...4C. doi:10.1080/21672857.2011.11519687. Retrieved 2012-10-03. By the early 1970s the Dry Moon was settled science, especially among lunar geologists in the United States. Had that gone differently, the last mission of the Moon Race, by the Soviets, might have changed everything. It discovered water within the Moon. Instead it was ignored. On August 9, 1976, Luna 24 launched toward the Moon on a Proton rocket, and nine days later landed safely in the southern part of the unexplored Mare Crisium... What it brought back was very special. The core sample was found by scientists M. Akhmanova, B. Dement’ev, and M. Markov of the Vernadsky Institute of Geochemistry and Analytic Chemistry to contain about 0.1% water by mass, as seen in infrared absorption spectroscopy (at about 3 microns wavelength), at a detection level about 10 times above the threshold. ^ Markov, M.N. ; Petrov, V.S. ; Akhmanova, M.V. ; Dement'ev, B.V. (1980). "Infrared reflection spectra of the moon and lunar soil". In Rycroft, M.J. (ed.). Space Research Proceedings of the Open Meetings of the Working Groups on Physical Sciences of the Twenty-Second Plenary Meeting of COSPAR. Twenty-Second Plenary Meeting of COSPAR. COSPAR Colloquia Series. 20. Bangalore, India (published 1 January 1980). pp. 189–192. doi:10.1016/S0964-2749(13)60040-2. ISBN 978-0-08-024437-2. Retrieved 13 April 2019. Fig. 3 shows the diffuse reflection spectra and scattering polar diagrams for two wavelengths (2.2 and 4.5 µm) for samples returned to Earth by Luna 24... Fig. 3 also shows slight minima near 3, 5 and 6 µm. These absorption bands are rather well identified by the valence bands and vibrations of a water molecule. The intensity of these bands (two or three times larger than the noise level) is a maximum for the sample taken from the depth of 143 cm, and becomes less at 184 cm; it is comparable with the noise level at 118 cm. A comparison with basalt spectra with known water concentrations allows an estimate to be made of the water content in the sample; at a depth of 143 cm, this is 0.1%... We have taken all the necessary precautions to protect the samples of lunar soil from atmospheric water, and thus have confidence in our results. The 5.5 to 7.5 µm structure in the reflection spectrum obtained by Saljut 5 may also favour the lunar origin of the water. ^ Water on the Moon: Direct evidence from Chandrayaan-1's Moon Impact Probe. Published on 2010/04/07. ^ Lakdawalla, Emily (13 November 2009). "LCROSS Lunar Impactor Mission: "Yes, We Found Water!"". The Planetary Society. Archived from the original on 22 January 2010. Retrieved 2010-04-13. ^ a b c Dino, Jonas; Lunar Crater Observation and Sensing Satellite Team (November 13, 2009). "LCROSS Impact Data Indicates Water on Moon". NASA. Retrieved 2009-11-14. ^ a b Pieters, C. M.; J. N. Goswami; R. N. Clark; et al. (23 October 2009). "Character and Spatial Distribution of OH/H2O on the Surface of the Moon Seen by M3 on Chandrayaan-1". Science. 326 (5952): 568–572. Bibcode:2009Sci...326..568P. doi:10.1126/science.1178658. PMID 19779151. ^ a b c d e "NASA Radar Finds Ice Deposits at Moon's North Pole". NASA. March 2010. Retrieved 2012-03-26. ^ "NASA – Lunar Prospector". lunar.arc.nasa.gov. Archived from the original on 2016-09-14. Retrieved 2015-05-25. ^ "It's not lunacy, probes find water in Moon dirt". USA Today. 23 September 2009. Retrieved 2009-09-26. ^ "Water discovered on Moon? : "A lot of it actually"". The Hindu. 23 September 2009. Retrieved 2009-09-26. ^ Watson, K., B. C. Murray, and H. Brown (1961), The Behavior of Volatiles on the Lunar Surface, J. Geophys. Res., 66(9), 3033–3045. ^ Simpson, Richard A.; Tyler, G. Leonard (1999). 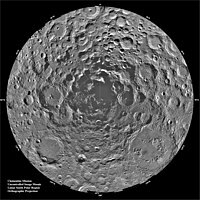 "Reanalysis of Clementine bistatic radar data from the lunar South Pole". Journal of Geophysical Research. 104 (E2): 3845. Bibcode:1999JGR...104.3845S. doi:10.1029/1998JE900038. ^ Campbell, Donald B.; Campbell, Bruce A.; Carter, Lynn M.; Margot, Jean-Luc; Stacy, Nicholas J. S. (2006). "No evidence for thick deposits of ice at the lunar south pole" (PDF). Nature. 443 (7113): 835–7. Bibcode:2006Natur.443..835C. doi:10.1038/nature05167. PMID 17051213. ^ Margot, J. L. (1999). "Topography of the Lunar Poles from Radar Interferometry: A Survey of Cold Trap Locations". Science. 284 (5420): 1658–1660. Bibcode:1999Sci...284.1658M. CiteSeerX 10.1.1.485.312. doi:10.1126/science.284.5420.1658. ISSN 0036-8075. PMID 10356393. ^ Linda, Martel (June 4, 2003). "The Moon's Dark, Icy Poles". ^ "Eureka! 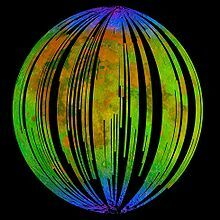 Ice found at lunar poles". August 31, 2001. Archived from the original on December 9, 2006. ^ a b Kemm, Kelvin (October 9, 2009). "Evidence of water on the Moon, Mars alters planning for manned bases". Engineering News. Retrieved 2009-10-09. ^ Paul Spudis (2006). "Ice on the Moon". The Space Review. Retrieved 2013-09-27. ^ "Japan's now-finished lunar mission found no water ice". Spaceflight Now. July 6, 2009. Retrieved 2013-09-27. ^ "Japanese probe crashes into Moon". BBC News. 2009-06-11. Retrieved 2013-09-27. ^ "MIP detected water on Moon way back in June: ISRO Chairman". The Hindu. 2009-09-25. ^ "Water on the Moon?". Science. 2009-09-25. ^ "Chandrayaan first discovered water on moon, but ?". DNA. 2009-09-25. ^ "Did India beat NASA to find water on moon?". NDTV. 2009-09-25. ^ Leopold, George (2009-11-13). "NASA confirms water on Moon". Retrieved 2009-11-18. ^ Neish, C. D.; D. B. J. Bussey; P. Spudis; W. Marshall; B. J. Thomson; G. W. Patterson; L. M. Carter. (13 January 2011). "The nature of lunar volatiles as revealed by Mini-RF observations of the LCROSS impact site". Journal of Geophysical Research: Planets. 116 (E01005): 8. Bibcode:2011JGRE..116.1005N. doi:10.1029/2010JE003647. Retrieved 2012-03-26. the Mini-RF instruments on ISRO's Chandrayaan-1 and NASA's Lunar Reconnaissance Orbiter (LRO) obtained S band (12.6 cm (5.0 in)) synthetic aperture radar images of the impact site at 150 and 30 m resolution, respectively. These observations show that the floor of Cabeus has a circular polarization ratio (CPR) comparable to or less than the average of nearby terrain in the southern lunar highlands. Furthermore, <2% of the pixels in Cabeus crater have CPR values greater than unity. This observation is not consistent with the presence of thick deposits of nearly pure water ice within a few meters of the lunar surface, but it does not rule out the presence of small (<∼10 cm (3.9 in)), discrete pieces of ice mixed in with the regolith. ^ Rincon, Paul (21 August 2018). "Water ice 'detected on Moon's surface'". BBC. Retrieved 21 August 2018. ^ Colaprete, A.; Schultz, P.; Heldmann, J.; Wooden, D.; Shirley, M.; Ennico, K.; Hermalyn, B.; Marshall, W; Ricco, A.; Elphic, R. C.; Goldstein, D.; Summy, D.; Bart, G. D.; Asphaug, E.; Korycansky, D.; Landis, D.; Sollitt, L. (22 October 2010). "Detection of Water in the LCROSS Ejecta Plume". Science. 330 (6003): 463–468. Bibcode:2010Sci...330..463C. doi:10.1126/science.1186986. PMID 20966242. ^ Nozette, Stewart; Spudis, Paul; Bussey, Ben; Jensen, Robert; Raney, Keith; et al. (January 2010). "The Lunar Reconnaissance Orbiter Miniature Radio Frequency (Mini-RF) Technology Demonstration". Space Science Reviews. 150 (1–4): 285–302. Bibcode:2010SSRv..150..285N. doi:10.1007/s11214-009-9607-5. ^ Neish, C. D.; D. B. J. Bussey; P. Spudis; W. Marshall; B. J. Thomson; G. W. Patterson; L. M. Carter. (13 January 2011). "The nature of lunar volatiles as revealed by Mini-RF observations of the LCROSS impact site". Journal of Geophysical Research: Planets. 116 (E01005): 8. Bibcode:2011JGRE..116.1005N. doi:10.1029/2010JE003647. Retrieved 2012-03-26. ^ Hauri, Erik; Thomas Weinreich; Alberto E. Saal; Malcolm C. Rutherford; James A. Van Orman (26 May 2011). "High Pre-Eruptive Water Contents Preserved in Lunar Melt Inclusions". Science Express. 10 (1126): 213–215. Bibcode:2011Sci...333..213H. doi:10.1126/science.1204626. ISSN 1095-9203. ^ L.F.A. Teodoro; V.R. Eke & R. Elphic. "Lunar Hydrogen Distribution after KAGUYA(SELENE)" (PDF). 2009 Annual Meeting of LEAG (2009). Retrieved 2009-11-18.